People tend to have conflicting opinions on tattoo/piercing aftercare so I'm not going to get into that.. but I like to use antibacterial soap on my tattoos/piercings when they're healing. It's pretty important that it's not drying though as having dry flaky skin around a new piercing is never good. I have tried some of Tattoo Goo's other aftercare products and decided to give their soap a go. It's very cooling and refreshing and it doesn't dry out the skin at all. In fact, it's really lovely to use - I have no complaints about it. However, my Simple 'Refreshing' Body Wash works exactly the same and I can pick that up for less than £1. So I'm not sure if it's worth shelling out the extra few pounds for the Tattoo Goo wash. 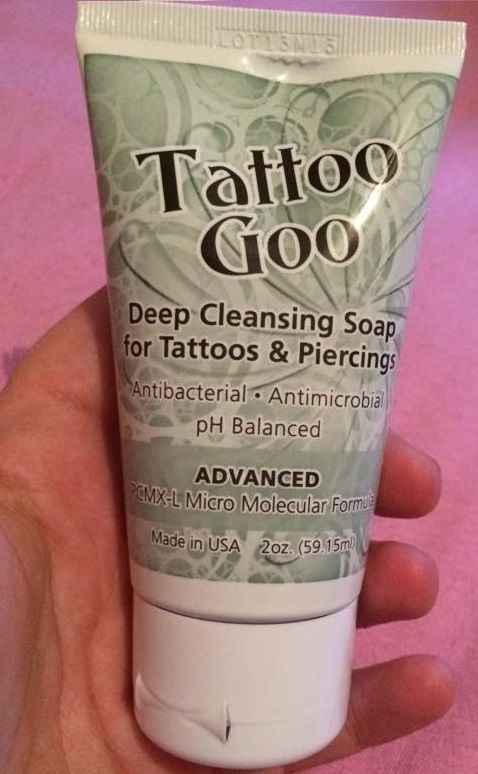 Although Tattoo Goo Soap is antimicrobial, antibacterial and PH balanced so perhaps it cleans at a more advanced level. That's not something that I'm interested in enough to research, but this stuff is pretty good and it's a solid choice for any new tattoo or piercing. What I love about this soap is that it's small enough to throw in my handbag so I can wash piercings/tattoos at work or when I'm out for a long time - but it's not small enough to be called 'travel size'. You get a decent amount of soap in the tube but it's not bulky at all. Tattoo Goo Soap is cheap in the USA (around £3) but it seems to cost around £7 in the UK. I bought it in an aftercare kit which came with some Tattoo Goo Saline Spray and I paid just over £10 for it online. Please make sure you rinse all the soap off properly though as I'm sure you know that not doing so can create problems for any new tattoo or piercing. Definitely give this soap a go though if you're not sure what to use and want to buy something that's made specifically for tattoos and piercings.